Stop the Deportations and Stop Dublin Deportation for Freedom of Movement!!! 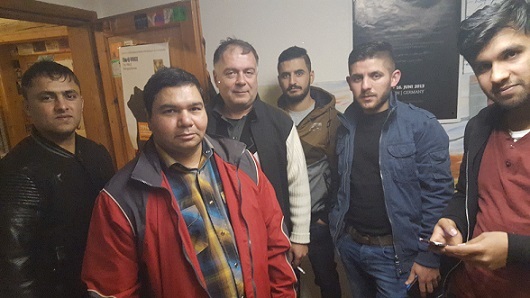 We the refugees in Apolda and Thuringen in general demand the unconditional respect for our constitutionally guaranteed rights to human dignity. These rights include our right to secured residence, security and safety, the right to work, the right to private and humane housing here in Apolda or in anywhere we may chose or wish to live. We are refugees living Auf dem Angespanne 3, 99510 Apolda, for more than 250 refugees. Many refugees are isolated in this Heim -lager already for more than (3years to 16years) without perspectives, many are under deportation threats, some are deported without notice of deportation. It is sad. We demand the recognition of our asylum cases as genuine attempt to seek internal protection from persecution in our home countries. Persecution that is aided and abetted by the dubious collaboration between Western governments and the tyrants and puppets that they installed as leaders in our countries. We refuse to accept the error-prone decisions on our applications by the Federal Office for Migration and Refugees (BAMF) in Thueringen. It has become common knowledge that BAMF is using official who collaborate with dictators and oppressive regimes in Asia to refuse the application of persecuted refugees for example of Cambodians in Germany and in such cases, the veracity of the asylum applications have been compromised and undermined leaving the refugees affected in danger. This must stop. We are protesting this and demanding an immediate Stop to planned deportations including the so-called Dubious-Dublin-Deportations! We demand the immediate stop of the forced, sinister and cynical ‘voluntary’ returns of refugees to countries where neither safety nor security can be guaranteed. Stop the terror and deaths at the EU borders and in the Mediterranean Sea. Stop the renewed Slavery and tortures of African Refugees that your policies are facilitating in Libya and your ever-expanding borders beyond territorial Europe. Several African countries have been turned into EU detention Centres by the corrupt and malicious agreements the EU has forced upon them. And this is even as the EU, led by Germany continues to wantonly exploit these countries. They destroy our countries and livelihood and thereby exacerbate our reasons of flight. We are humans too and we have a right to a dignified life. This is our demand and it is NON-NEGOTIABLE!!! We will live it. Stop the crimes of family separation – We demand our right to family reunification. If your families are important to you here in Europe, ours are even more so. We, the Refugee Community in Apolda – Thueringen is inviting you, the refugees and activists, political movements and groups, friends and supporters to join the demonstration and our protests. We need your solidarity as we continue our struggle against colonial injustice, to expose the German Deportation Culture loaded with isolation and exclusion, humiliation, intimidation and the maltreatment of refugees. We refuse to accept deportation as the norm and our fight against deportation threats, racism, and discrimination and against the subjugation of refugees in Apolda. For too long the world was silent about the enslavement of African people in the past and now do not stay silent at the inhumane treatment of refugees by Western European deportation regimes. No! We cannot be silent today! We are determined to protest till end: Against the inhuman treatments of the refugees in Apolda by the District Authorities of the Foreign office, The Police, the Lager Security and Maintenance, the social welfare service of lager in Apolda under the Weimar Administration office in Thueringen.